Humankind has been dreaming of traveling to space for a long time. Jules Verne thought we could reach the moon with a giant cannon in the 1800s. 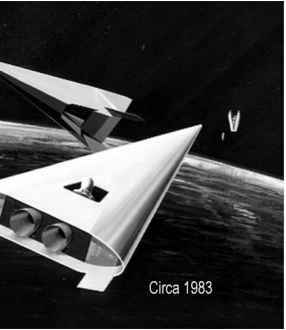 In the early 1960s there was a dedicated push to develop the vehicle configurations that would permit us to travel to space, and back through the atmosphere, as readily and conveniently as flying on an airliner to another continent and back. That idea, or intuition, was necessarily coupled with advanced propulsion system concepts, that relied on capturing the oxygen within our atmosphere instead of carrying it onboard from the ground up, as rockets developed in Germany in the 1940s did, and as satellite launchers still do. During the 1960s the concept of space travel extended beyond our planet, to our Solar System and the Galaxy beyond (see Chapter 1), using power sources other than chemical, such as fission and fusion. Not much is left nowadays of those dreams, except our present capability to build those advanced propulsion systems. Traveling to space in the foreseeable future is a multi-step process. The first step is to achieve a two-way transport to and from orbit around our Earth, that is, a Low Earth Orbit (LEO), see Chapters 2, 4 and 5. This is a critical first step as it is the key to moving away from our Earth environment. For any future development in space, travel that transits to and from LEO must be frequent and affordable. From a vision of spacecraft parked in LEOs there are then several options. One is a Geo-Synchronous Orbit or Geo-Stationary Orbit (GSO) that is at an altitude of 35,853 km (22,278 statute miles) and has an equatorial orbital period of 24 hours, so it is stationary over any fixed point on Earth. Another option for the next step is an elliptical transfer orbit to the Moon. The orbital speed to reach the Moon is less than the speed to escape Earth's orbit, so the transfer orbit is elliptical, and requires less energy to accomplish (but more logistics) than reaching GSO. Depending on the specific speed selected, the time to reach the Moon is between 100 to 56 hours. In fact, the Apollo program selected a speed corresponding to a 72-hour travel time from LEO to the vicinity of the Moon (see Chapter 6): in terms of the time needed to reach it, the Moon is truly close to us. All circular and elliptical orbits are, mathematically speaking, closed conics. Inertia is a resistance to change in speed or direction. As we approach light speed, the inertia/mass approaches infinity. As the mass approaches infinity the thrust required to maintain constant acceleration also approaches infinity. Thus, at this point we do not know how to exceed the speed of light. If that remains the case, we are trapped within the environs of our Solar System. There is a second major issue. Human tolerance to a continuous acceleration for long periods has yet to be quantified. Nominally that is considered about three times the surface acceleration of gravity. At that rate of acceleration the time to reach a distant destination is numerically on the same order as the distance in light years. So if a crewed spacecraft is to return to Earth within the lifetime of its occupants, we are again limited to 20 light years of so. That is within the distance to the seven or eight closest stars to our star, the Sun. As much as the authors would hope to travel in Galactic space, it will require a breakthrough in our understanding of mass, acceleration and propulsion. Until that time we have much to explore and discover within the environs of our Solar System. Fusion Laboratories, Mr Simone, GS, H. David Froning, Gordon Hamilton, Dr Christopher P. Rahaim and Dr John Mason, Praxis Subject Advisory Editor. Special thanks go to Clive Horwood of Praxis, for his patience, constant encouragement, and prodding, without which writing this book would have taken much longer.